The days leading up to the International Canoe Federation (ICF) Canoe Polo World Championships were supposed to be a joyous time for Anton Jacobie, the leader of two squads representing the southern African nation of Namibia. But that wasn't the case after he learned that the European company that was hired to manufacture 16 boats for his team had an accident while transporting them from Poland to Denmark and that things were behind schedule significantly. Gratomic, a Canadian graphite-mining company that does work in the country and was already a sponsor of the team, learned about the situation and reached out with an offer. They would pay for seven canoes valued at a total of $21,000 USD and have them shipped on time by a Chinese manufacturer. "At least we could start," he said. "A lot of stress" was drastically reduced and Jacobie knew he would be able to put his men's and under-21 teams in the pitches at the International Flatwater Centre in Welland, thanks to the generosity of the company from the Toronto area. "Sometimes, with tears in your eyes, you have to say thanks to a group like that," Jacobie said Friday in a break between action. "It's unbelievable. For us, that's a lot of money," said Jacobie, also explaining that sponsorship dollars are limited, no funding is provided by any governments back home, and that his team members pay thousands of dollars out of their own pockets to participate when expenses for the entire week are calculated. The boats Jacobie said he ordered in January did arrive in Welland, but not until three days into the tournament. Now having six extra vessels, Jacobie heard Team Iran was also having complications with equipment inventory and decided to sell them six boats at less than cost, also explaining that two of his team members shipped their own personal canoes for the competition. Jacobie said he immediately wanted to help, as he "knew what it was like to go through a similar situation," and that Iran is also a very dry country where the sport is in the early stages of being developed. There is one Olympic-standard facility in Namibia for training and the closet natural body of water is a dam that is about 200 kilometres away from where most of his team live. 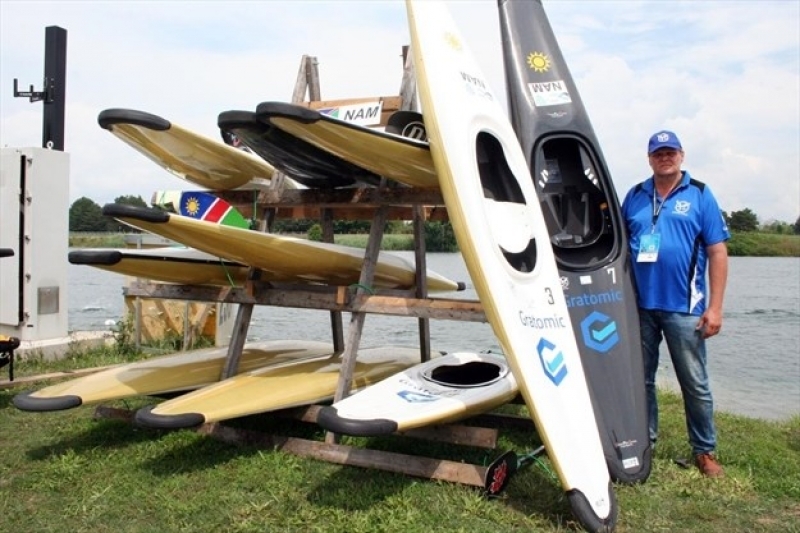 Jacobie is the secretary general for the country's canoe association and said he strives to raise awareness about canoe polo, which he says is only played two nations in his home continent – Morocco and Namibia. "It's my goal to develop it in Africa," he said. be in the top 10 or 11, after the action wraps up on the weekend, he did point out that it's the first action his athletes have seen all year other than the qualifying rounds help back home as they put the world championship together. In European countries, where the sport is more popular, teams often play in up to 20 tournaments per season, according to Jacobie. Greg Smale, chief official for the championships and chair of the ICF, said he is delighted that Team Namibia, as well as Iran, were able to compete. "We wouldn't be a sport if we didn't all work together," he said.